Our programming for younger members supports them in professionalizing themselves, getting a job, and connecting them with experienced members. These activities are all oriented towards ensuring that members with established careers are able to pass on their knowledge to those just starting in the profession, and actively support them. That exchange between our longstanding members and younger members is represented by passing the torch—specifically, the drip torch. 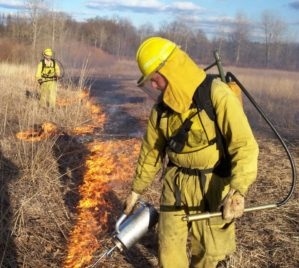 A drip torch is a fuel canister with a wick, used in prescribed fire, wildfire suppression and other applications, and is an important tool for many natural areas managers. While the drip torch is a symbol of our commitment to our younger members, during the Natural Areas Conference we pass a real torch during an activity we call Prairie Fire. This is an important part of the history of our organization, and brings together younger and older members in a good-natured partnership and competition. A drip torch in action.